At the age of 12, Haag along with several other boys, played hooky from school and, fearing that they might get a thrashing from their dads, hopped in a box car headed for wherever it might go. After riding a while all of the boys except Haag became afraid, left the box car and hiked back to Plymouth Indiana, their home town. Haag kept riding and riding until he found himself in Philadelphia, later going to New York City and other places of the East. The next thing for Haag to do was to try to make a living, so he obtained a shoe-shinning outfit (an old one of pocket size) and earned a few nickels, at the same time getting a few more by selling newspapers. This he continued to do until he was about 16. In his home town he was quite a musician for his age; in fact, led a local orchestra, and as he had circus inclinations his eyes were next turned that direction. His first show engagement was as alto player with T. Cooney, bandmaster with "Windy" Smith, who had a circus known as the Robinson Two-Car Show, which operated only for a season or two. After leaving the Robinson show, Haag made fairs, picnics and old soldiers' reunions selling juice. With each drink he gave a prize (spend a nickel and get a prize, was his spiel), and he believed he was the originator of that plan. For four or five years he did that kind of work - until he saved about $1,000. His next venture was a minstrel show, which proved a failure, and Haag went back to box car traveling, and later again selling juice for a few more years. Then his ambition to become a circus owner reappeared. After saving a little more money selling juice he bought a small tent and a few ropes for $20 from an old side-show man by the name of Squire Bowman and used it for a side show on fairgrounds. while along the Red River at Shreveport, LA one day he saw a fisherman with a flatboat and it gave him an idea. The fisherman was approached, a price of $20 offered for the boat and Haag was soon the owner. He then managed to rig up a few seats and obtained a bass drum, only to learn that performers were needed to put on a performance. He scouted around until he picked up a performer named Jim Alberta, whose specialty was blackface. As Haag was about to float down the Red River, Ed Conklin, a juggler, happened along and Hailed Haag, who immediately joined him out. So down the river they went, stopping at different sand bars, where they gave what they termed a circus. The main feature of the show was Haag's prize with each drink of lemonade. From the Red River they went on the Catawba, then down the Bayou Teche, which emptied into the bay. The "circus," called merely "The Big Show," moved downstream because there was no transportation to pay. Upon reaching the bay "The big Show" was unloaded and placed on a two-wheel cane cart drawn by three mules (abreast). With this cane cart, Haag made the French country and the lower Red River. After this cane-cart tour, he bought his first team of horses and wagon (a common old farm wagon). The circus was next transported all the way to Kansas - a one wagon show, so to speak. From then on Haag bought wagon after wagon and added to his baggage stock. 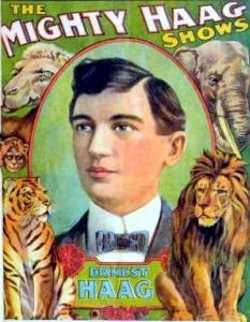 In the spring of 1909 Haag first used the title Might Haag Shows, he put the show on rails and traveled that way about seven or eight years, covering the whole country. The show the first season opened with 10 cars and closed with 18. When Haag had it on wagons the very first time he confined his territory to west of the Mississippi River. After closing the railroad show and going back to wagons, later trucks, he played east of the Mississippi, which has been his territory since. 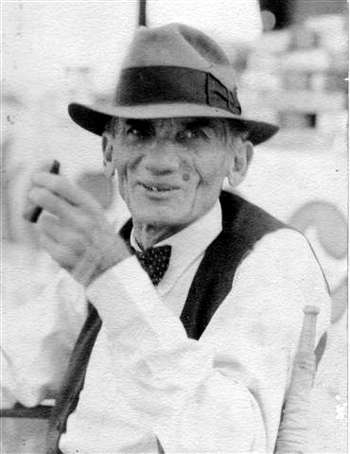 Haag gave W. R. Kellogg a great deal of the credit for the early success and growth of the Haag show. There were many others who received their schooling in show business under the Haag banner. Haag considered himself very fortunate in that he was always able to do things without first having to borrow money. He was the owner of considerable real estate at Shreveport, LA, where he had a beautiful home, and he also had a home at Marianna, Fl, not to mention other properties in that State, as well as in Oklahoma. For 18 years he was a director of Shreveport's largest bank, the Commercial National. Haag's mission in this world was to "make everybody fell good." 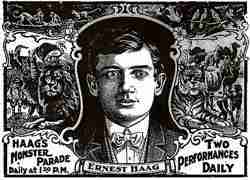 Ernest Haag died of heart failure at the age of 68 on February 1, 1935. The circus he created would continue to operate for three more years. The circus closed in 1938 after an impressive 43 years of touring the United States.